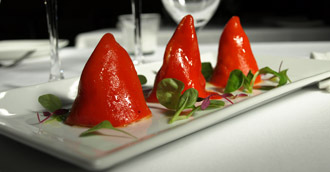 Executive Chef Manuel Romero of Ibiza Restaurant in New Haven, Connecticut shares a delicious taste of the restaurant with his recipes for a three-course menu of Tomato Gazpacho, Stuffed Piquillo Peppers, and Crema Catalana. The attractive restaurant located in the heart of downtown, features inspired traditional Spanish cuisine with modern touches, an excellent wine list, and attentive service. Born in La Coruna, Spain, Chef Manuel Romero grew up a family that loved cooking traditional, tasty food. When he was 14 years old, his family moved to the United States, and he started cooking alongside his mother. He loved being in the kitchen, watching and learning, and began by cooking steaks and omelets. Although he told me that every man and woman in his family knows how to cook, he is the first professional chef in the family. He attended New York Technical College in Brooklyn, New York where he studied hospitality management as well as focusing on the culinary arts. A chef must continue to build upon his training learning new techniques; he honed his craft in New York working with Chef Luis Bollo of Meigas and at the Hyatt Hotel. Further training came by working at Meson Galicia in Connecticut, and training in Spain. 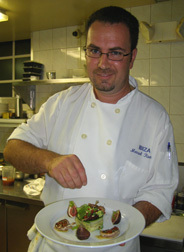 In 2001, he joined Café Pika Tapas as a Sous Chef. One year later, the restaurant changed its name to Ibiza Restaurant and expanded its culinary focus beyond tapas. He moved up the culinary ladder, and is now the Executive Chef where his vision is to create an atmosphere where his team will enjoy what they are doing, learn new things, and always think about the customer. I had dinner at Ibiza Restaurant in August 2010, and had the opportunity to get to know charming Executive Chef Manuel Romero. He is someone who is passionate about what he does and enjoys dreaming up new recipes for his customers' pleasure. He changes the menu three to four times per year, as well as seasonally when new products arrive at the market to keep things fresh and exciting for the staff and the customers. Chef Romero also maintains a few core popular dishes on the menu by request of the restaurant's regulars, as he knows that there is a balance between being creative and knowing what the customers will enjoy eating. His culinary focus is new cuisine from Spain, what he describes as strong Spanish cuisine with touches of other parts of the world, using a traditional base, and working around it, perhaps adding coconut milk to his scallops, or other ingredients not normally associated with Spanish cuisine. 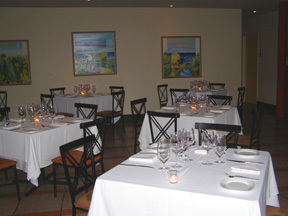 In addition to the regular menu and the inspired Tasting Menu, Ibiza Restaurant has traditional culinary nights, there is roast suckling pig on Monday, paella on Tuesday, and tapas at the bar Wednesday and Thursday. Like many modern chefs, he enjoys creating with agar-agar (a natural seaweed gelling agent), as well as creating inspired ice creams, and sorbets, and is always looking for new flavors and to use products differently in his cuisine. When not working at the restaurant, he enjoys thinking up new recipes, creating special holiday meals for his wife, Andrea, his parents, and his brothers, and watching tennis, soccer, and the Food Network, as he is always interested in learning new techniques. Chef Manuel Romero graciously shares his recipes for Tomato Gazpacho, Stuffed Piquillo Peppers, and Crema Catalana. ¡Buon apetito! 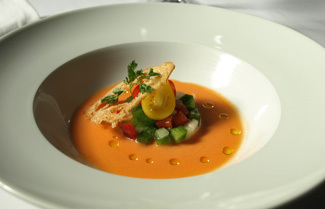 Chef Manuel Romero's Tomato Gazpacho is like drinking liquid summer sunshine with its rich, ripe melding flavors. He serves the Tomato Gazpacho at the restaurant in attractive shot glasses as a delicious amuse bouche. Preparation: Cut all the vegetables into chunks. Put the tomatoes, scallions, cucumber, almonds, and red bell pepper in a blender, and purée. Add the olive oil slowly and then add the sherry vinegar. Taste for salt. Place the gazpacho in the refrigerator for a minimum of 1 hour to chill before serving. Chef Manuel Romero's Stuffed Piquillo Peppers have a delightfully tasty filling made with Yukon gold potatoes, carrots, asparagus, and tuna that is mixed with mayonnaise and olive oil. Piquillo peppers are red peppers grown in Northern Spain. Their name in Spanish translates as "little beak," as the peppers resemble a bird's beak with their curved and pointed end. Method: Cut the potatoes, asparagus, and carrots into small dices, and cook in boiling salted water until al dente. Chill the vegetables in the refrigerator. When the vegetables are cold, mix them in a bowl with the remaining ingredients. Season to taste with salt and pepper. Stuff the piquillo peppers with the tuna and vegetable mixture. Serve cold. 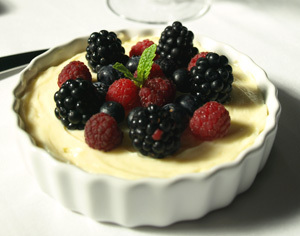 Chef Manuel Romero's Crema Calalana is a luscious milk based pudding flavored with lemon, cinnamon, and vanilla bean. Method: Pour 3 cups of milk into a pot. Add the cinnamon, vanilla bean, lemon peel, and sugar, and bring to a boil. Lower the temperature. Dissolve the cornstarch in 1 cup of milk in a bowl. Beat the egg yolks and fold into the milk. Strain the flavored milk through a sieve. Pour the milk into a large pot and gently heat. Gradually add the egg yolk mixture and stir. Continue heating the milk, stirring continuously, until it is thick and creamy. Remove from the heat, allow mixture to cool, and then place it in the refrigerator. When the mixture is cold, whisk the cream again. Pour into serving bowls and garnish with berries. Ibiza Restaurant is open for Lunch Fridays from 12:00 pm until 2:30 pm, and for Dinner Monday through Thursday from 5:00 pm until 9:00 pm, and on Friday and Saturday from 5:00 pm until 10:00 pm. The restaurant is closed on Sunday. Read about Ibiza Restaurant in the Restaurants section. Read other articles on the Connecticut Wine Trail in the Destinations and Wine Cellar sections. © September 2010. Luxury Experience. www.LuxuryExperience.com All rights reserved.